With the 10th anniversary of the 2008 financial crisis at hand this month, it’s important to ask if you’re ready for the next stock market crash — or even the next bear market. If it happens again, should you stay the course — or go to cash? With the long-term mutual funds portion of your portfolio, the answer is: Stay the course. But why? Wasn’t the 2008 financial crisis painful? Bottom line, the S&P 500 extended a drop that had already begun into a nearly 57% plunge at its trough. Only the Great Depression’s 86.2% nosedive in 1928 through mid-1932 was worse in modern times. Still, many investors have learned that the best way to avoid hurting the long-term, diversified portion of their portfolios is to stay the course — that is, stay invested. A key indicator: 84% of financial advisors say their investor clients, this time, are more likely to make and stick to a financial plan, according to a poll by Nationwide Advisory Solutions. So, what’s right for you? What should you do next time? Actually, it’s at least as important to know what not to do next time the market is as volatile as it was in the 2008 financial crisis. First of all, stay the course. Don’t go to cash with the portion of your mutual funds that are devoted to an investment plan based on a long time horizon. If you’re in retirement or close to it, cashing out whatever amount you need for an upcoming bill can be prudent. And going to cash can be wise with your individual stocks, based on the rules of a time-tested strategy that tells you when to get in and out of securities. IBD’S TAKE: Are you a newcomer to investing who wants to buff up your stock investing skills? Check out this guide for stock market beginners. Yet it’s anything but wise with the diversified portion of your portfolio — your stock mutual funds — for the average investor with a long time horizon. Why? Studies repeatedly show that individual mutual fund investors rarely, if ever, get out of the market near its top. And they rarely, if ever, get back into the market at its bottom. Instead, time and again they end up selling low — then buying high after missing the often explosive start to a rally. Markets have recovered from every downturn, T. Rowe Price senior financial planner Stuart Ritter says in a new study. In every 15-calendar-year period since 1926, stocks have notched positive gains, he says. That’s despite depressions, world wars and recessions, including the 2008 financial crisis. So, what should you do instead of going to cash in the next stock market crash? Stay invested. If you try to time the market with your long-term mutual funds, you’re likely to miss the best days in the market — the typically unpredictable start of a new bull run. The price for missing out is that your total returns suffer. Look what happened if you had invested $10,000 in the S&P 500 between Jan. 1, 1998, and last Dec. 29. If you stayed put, remaining fully invested through the market’s ups and downs, your average annual return was 7.2%. Your nest egg would have ballooned into $40,135. But if you got cold feet and pulled out, what then? If you didn’t get back in soon enough to benefit from rallies after various pullbacks, and you missed just the 10 best market days during that 20-year period, your average yearly return got slashed by more than half to just 3.53%, JPMorgan Asset Management calculates. Your end balance would have been a far more modest $20,030. 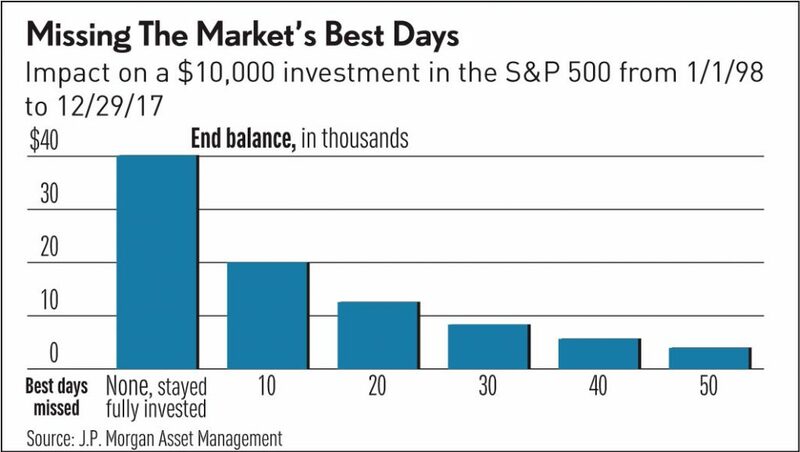 If you missed the 40 best market days, your rate of return would have shrunk to a 2.80% loss. Your $10,000 would have shriveled to $5,669. And it’s all too easy to miss the best days. Six of the best 10 market days occurred within two weeks of the 10 worst days between 1998 and 2017, JPMorgan notes. The best day of 2015 — Aug. 26 — was just two days after the worst day, Aug. 24. But once a rally begins, it’s only human nature to wait for some sign that the rebound is for real and not just some dead-cat bounce. Staying on the sidelines like that, you miss days with some of the juiciest returns. The post Ready For The Next Stock Market Crash? Here’s How To Protect Your Portfolio appeared first on Investor’s Business Daily.